It is time to have a serious discussion on the Second Amendment in this country, one that is adult and mature. We need to talk about sensible issues. However, in the post Newtown Massacre environment, we see people beginning to engage in posturing on both sides of the issue. On the left, you hear calls for the complete repeal of the Second Amendment. On the right, you have demands for every teacher to be armed. This is not productive, and if it continues, it will become another wedge that splits this nation apart. We have enough of those already. This can no longer be an issue for political posturing on either side; there are already too many dead. In light of this, I want to talk about what the Second Amendment actually guarantees, and then I want to examine what I think is a sensible position on this issue, and why we need to look at it. Most people, especially in the media, do not discuss the entirety of the text, nor understand the context that it came out of. So I will start off with some background on this. In the British Army, weaponry was accorded to soldiers by military rank, which often also corresponded to social class. The infantry was typically pulled from the ranks of the landless poor, the unemployed, and even petty criminals. As was the custom at the time, they only received inferior weapons, most typically a musket called a Brown Bess. This gun was extremely inaccurate, and only worked as a war weapon when you had many soldiers firing simultaneously. (This is called a volley.) The finer quality of weapons was reserved to the officers, which also happened to be noble born. Admittedly, this was partially due to cost, but it was also a way to keep the rabble from having truly dangerous weapons. In this, the Right is correct in a way. They kept powerful and accurate weapons out of the hands of the lower classes as a way to help prevent revolution. Of course, as we saw in the many revolutions that have followed, it isn't really that great of a strategy. Sheer numbers will eventually overwhelm a well armed minority. One only needs to look at what happened in Egypt, where the government was one of the best armed in the Middle East, to see how little superior firepower actually means to determined revolutionaries. So to return to the point, the European militaries had poorly armed and minimally trained infantries that were drawn from the low end of society, and a well armed, well trained, upper officer caste. Further, there was almost no mobility between these groups, and service was often by conscription. In other words, people in the infantry typically did not choose to serve, and then they were given poor quality armaments. All of this was done to build the world spanning empires of this period. An understanding of this helps frame the existence of the Second Amendment. Look back at the text in light of this information. It starts "A well regulated Militia." As envisioned by the Framers, there was no Standing Army of the United States. Although this was quickly modified because they realized that there did need to be a national army, it was still supposed to be the lesser force. The primary force in the country was to be the state militias. This system still exists in the form of the National Guard, which is technically under the control of the Governors of the states. The next part, "being necessary to the security of a free State," indicates the role of this Militia. The militia, as the National Guard does now, was responsible for the security of the States, both individually and collectively. Remember, having freed themselves from the yoke of one Empire, the Founders were very hesitant to create a new one in its place. The states wanted the primary control of military forces, and this was the compromise hammered out. It protected the states from each other, but created a framework for mutual defense. The last part is the section that is the problem when removed from the context it was written in. "The right to keep and bear Arms, shall not be infringed." Taken out of context, it seems pretty plain, you cannot infringe on the right to bear arms. In context, it becomes clear that the right lies within the bounds of a well regulated militia. What this amendment initially guaranteed was that all citizens who wished to serve in a militia would be allowed to, and further that they would be allowed to have whatever weaponry they wished. There would be no class stratification for arms, and also that those militia members would be allowed to keep their weaponry. This was not typically allowed in the European military, where the weapons belonged to the government, and were only given out in preparation for battle. Further, allowing the Militia members to keep their weaponry allowed them to be ready to fight at a moments notice; there would be no need to go to the armory to retrieve their weapon. This made the state forces nimble and quick to respond. So to tie this up, the Second Amendment basically provides that all citizens can serve in the Militia, and if they do so, will be allowed to have high quality weapons, retain them in their homes and carry them at will. But it also means that in order to do so, you must be a part of the well regulated Militia, or at least be willing to serve as such. This is actually not that much different from the laws in Switzerland, where all men must serve in the military, receive military training, and then for the rest of their lives, keep their weapons with the knowledge that they may be called upon to defend the country. Essentially, all Swiss men are members of the Army Reserves, which means that every home has military grade weaponry in it. So, taken under this view, according to the Original Intent of the Second Amendment, the only people who should have weapons are those that have served or are currently serving in either the military or National Guard. But over the years, as we have become safer, and increased in population, there is not the need or ability for all Americans to serve in this manner. Consequently, the interpretation of the Second Amendment has expanded. And this is what sets the stage for our current dilemma. We need to ask ourselves what are the limitations? Even in the post Revolutionary War America, there were limits to the types of weapons people could have. For example, citizens couldn't have cannons, nor could they have the rudimentary bombs that existed in that time. There were always controls on the armaments that were permitted outside of military armories. Today, this extends to a wide range of weapons. For example, people cannot own tanks, nuclear bombs or chemical weapons. Of course, the counter to that is, those are weapons not arms, and don't fall under the Second Amendment because it specifically states arms. However keep in mind, switchblades, swords and long knives are also arms, and those are almost universally prohibited, at least if they are sharp and carried in public. Since the switchblade manufacturers lack a powerful lobbying arm, their products are illegal. Consequently, we already limit arms, at least unless politically powerful forces align behind them. I think a better tipping point of the limitations is how many people the weapon can harm in one use. The heavy weapons that are illegal are ones that are designed only to kill people, typically lots of them, and do so at a rapid rate. Therefore we outlaw the weapons of mass killing, like bombs, grenades and similar devices. However, automatic machine guns and the like are also designed to kill masses of people; they are not hunting weapons, nor are they even weapons of self defense. A machine gun is not the item that you would pull to fend off a mugger; it is a weapon to kill dozens, and if used in that sort of situation, many people other than the bad guy would be dead. Outside of a zombie apocalypse, you are unlikely to be set upon by that many people at once. Outlawing this sort of firearm would not violate the intent of the Second Amendment. Remember, the Framers never imagined this sort of weapon, they barely had passed from the Musket to the Rifle in their time, and almost all weapons had a very limited kill speed. As I said, even in their day, they outlawed for private ownership their form of weapons of mass death. The same thing can be said of high capacity magazines. Again, these are not items used in hunting, because you try to kill cleanly with one shot. You don't want to pump a deer full of lead. Similarly, they are also not for self defense either, for the same reasons listed above. If you cannot stop an attacker with a few bullets, you are either a terrible shot, or you are fighting an evil superman. In the first case, you may very well kill others, and in the second case, you're going to die anyway, no matter how well you are armed. First, there is the claim that carrying a gun is the best form of self defense. I've talked about this one in a previous post, but I will restate it here. A gun is only actually good for self defense if you have had military or police training. The bulk of military training is not to teach you how to shoot, but how to be able to pull the trigger. Killing people is not instinctive and there have been many studies that prove this. You actually have to train someone to be able to kill, because every instinct in their bodies rejects it. Interestingly, there is some proof that first person shooter video games actually function as desensitization training. This is also at least partially born out by the number of mass murderers who loved violent video games. However, I am not going to go as far as confusing correlation with causation. Still, I do think that the Right has a point that these sort of video games do contribute to a reduction of the value of human life. But still, without training, people will hesitate before firing a fatal shot. A criminal who has brought a gun to commit a crime has come to terms with killing and is unlikely to hesitate to pull the trigger. Therefore, in that moment of hesitation, the person carrying the gun is actually more likely to be killed than an unarmed man. A few years ago, I was inside a restaurant when I saw the manager get jumped in the parking lot. One of the employees and I rushed the attacker and we were unarmed. The attacker probably was, but our sudden and unexpected retaliation shocked him so much that he fled. That and the fact that we jumped him and started pounding him. I am NOT recommending this as the appropriate response in a mugging, but sudden, unexpected action is more likely to turn the tables than a gun. Another thing to remember is that a gun is not necessarily good for self defense in a situation like Newtown. Again, without extensive training in high pressure shooting situations, it will become extremely hard to acquire the target and shoot with necessary accuracy. The reality in a situation like this is that you are as likely to kill an innocent as you are to stop the murderer. Even with military or police training, friendly fire deaths are common. Without that training, they are almost certain. Remember, we almost always overestimate our skills, and saying that if we were armed in a mass shooting we could stop the killer is an abject denial of reality. To sum this up, unfortunately, despite what TV and the NRA tells us, we are actually in more danger if we are armed than if we are not. The only way to make this not the case is to get the same sort of training that the military provides. This leads to another sensible gun law, if you are going to carry a weapon for self defense, you should receive military quality training on how to use it. The second thing that the NRA constantly brings up is that we need guns to protect ourselves from tyranny. They even state "fear the government that fears your gun." My response to this is, if you are that afraid of your government, you need to vote them out of office now. And if you are part of a tiny minority that that thinks the government is already irredeemably evil, consider moving to some other country. The truth is, Americans will not suffer the yoke of tyranny for very long at all. We are a rebellious and malcontented group of people on the best of days. This is a country that will march on Washington at the slightest provocation. You only need to look at the Tea Party and the Occupy movements to see this. If we ever actually faced the sort of dictatorship that the fringes on either end fantasize about, that regime would only last a few days. Look how quickly most revolutions happen even in countries with iron fisted control, and the masses are often armed with little more than sticks and stones. With all of the handguns and rifles in this country that would remain legal, even under an assault weapon ban, a hypothetical totalitarian government would never be able to take root in this nation. This is a straw man fallacy, meant to distract us. The final issue that the NRA brings up is that if you outlaw guns, only outlaws will have guns. Of course that's true, it's a recursive statement, just like any other if-then assertion. 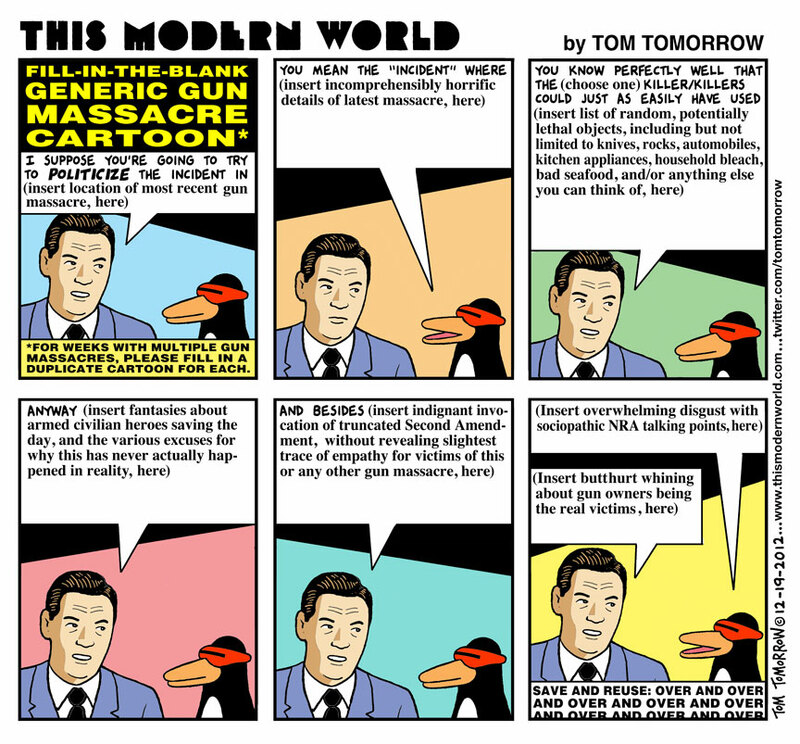 However, it is also unfounded, at least in the case of these recent mass shootings. Many of them, especially Newtown, were essentially crimes of opportunity. The guns were legally obtained, but they were obtained by people who shouldn't have been able to get them. To be very blunt, mentally ill people and people who have been convicted of felonies should not be able to have guns. It doesn't matter if that infringes on their rights; the rest of us have a right to not be killed. There is vast precedent for this. In many places in this country, if you are a convicted felon, you lose your right to vote. The same should be true of owing a gun. You choose to commit a crime, and as such, you know that there will be consequences. Losing your right to own a gun is no worse than losing the right to vote, and in all honesty, it is actually less severe. Preventing the mentally ill from owning guns is a stickier legal proposition, especially given that people do not have control over mental illness. Taking away a right for something that is an illness is on some level disturbing, but we need to avoid the slippery slope fallacy. There is a clear dividing line here and laws could be very carefully written to tightly constrain the limitations for mental illness. Still this needs to happen, given how many mass murderers are not mentally stable. To sum this up, we need sensible gun control in this country. We do not need to repeal the Second Amendment, nor should we arm everyone in some sort of Wild West fantasy. We need to do the following things in the wake of the Newtown Massacre. First, we need to ban assault weapons, weapons that have no legitimate self defense or sporting purpose, but are designed to kill large numbers of people. Second, we need to outlaw high capacity magazines, Teflon jacketed bullets, and other sorts of projectiles that are again designed to kill people exclusively. Third, we need to keep guns out of the hands of convicted criminals and the mentally ill. Fourth, we need to close the gun show loopholes that allow people to purchase guns without a background check. Fifth, we need to require that all people who have a concealed carry permit go through military grade training on how to use their weapon, and prove that they are accurate and competent in their handling of it. None of these things would violate the intent of the Second Amendment, either as originally constructed, or in it's modern permutations. I do not for one second believe that these steps are a panacea. No matter what we do, there will always be tragedies like the ones we have suffered this year. No matter how distasteful it is, we have to accept that fact. Still, we can act to limit the both the frequency of these events and numbers of people who die in them. In the end, how many more children have to die before we act?